Finding your way to your destination is one of the most commonly encountered problems when travelling abroad, naturally one which is only aggravated by an inability to speak the local language. Fortunately, thanks to GPS, technology has now gone a long way to solving this problem for anyone with suitable equipment. GPS stands for Global Positioning System. It is a system of satellites which together create unique reference points for every location on earth. Originally developed by the US military, it has now found a wide range of civilian uses. Equipped with a suitable receiver, you’ll be able to tell exactly where you are anywhere on the planet. Couple that with some GPS-ready maps, and getting to your destination should be simplicity itself. GPS receivers come in a wide variety of forms today. They are often now included in other handheld devices such as PDAs or high-end mobile phones. If there are no GPS facilities in your handheld by default, sometimes you can purchase an add-on which will make those capabilities available. There are also dedicated GPS devices which are very much focused on providing location-based information, although some have now been expanded to include more PDA-like abilities, such as facilities for playing MP3s or surfing the Internet, too. Visualisation quality - At the most basic level, you may get nothing more than a two-dimensional map. Higher-end devices will offer 3D graphic visualisations, as well, perhaps, as satellite imagery and topographical maps. Audio directions - Some devices will allow you to program in your intended destination, then offer you a series of spoken directions on the route you need to take to get there. This is particularly important if you’re driving. In some units, the speech facility will be limited to pre-programmed instructions like “Turn left in 100 metres”; others will be able to read out the place names to you as well using a text-to-speech capability. Traffic information - Some GPS devices don’t just stick you with static maps. They’ll offer you real-time information about things that might disrupt your journey, such as traffic jams or accidents. Some will even dynamically reroute you around emerging problems. Often, real-time information services will cost you a monthly subscription, although you can sometimes now find them for free. Other information - Some services offer more than just traffic information. They will also tell you about other points of interest in the vicinity and allow you to tag them as your destination or waypoint. 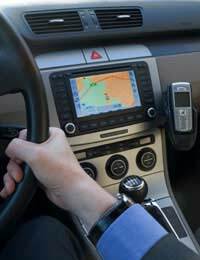 Connectivity - Some GPS devices offer web or Bluetooth connectivity or can act as FM transmitters so you can send the audio to your car stereo. Rugged GPS DevicesIf your location-finding requirements are beyond the usual, for example if you need to work or travel through dangerous or harsh environments, a typical GPS receiver might not last long. Fortunately, specially ruggedised devices are available for exactly this purpose. They will happily let you drop them, bake them, chill them or douse them in water and still emerge in a perfectly functional state. Satellite navigation systems have quickly woven themselves into the fabric of our daily lives. The range of features they offer has been increasing, while their price point has been falling. Perhaps it’s time for your to find your way to one now.